Sitting in the audience tonight at the 2014 Hall of Fame Enshrinement Ceremony, it was clear, if not cliché: If ever there was one person for whom you could say has had a storybook life, it is one Bob "Slick" Leonard. Standing on stage, an 82 year-old man with Larry Bird and Mel Daniels behind him stirred the echoes of the very origins of the game of basketball with remarkable, nearly-photographic recollection. Slick talked about his high school coach, a protegé of Glenn Curtis, who coached "Johnny Wooden" in high school. 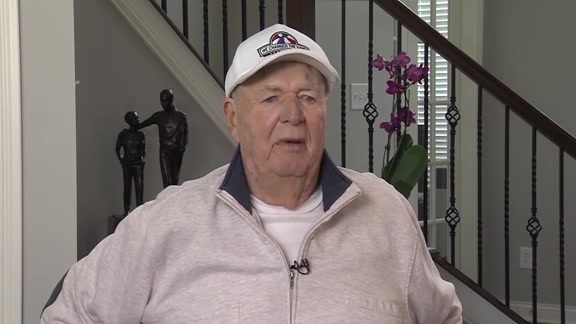 Slick brought up playing against legendary Kansas coach Phog Allen, facing Dean Smith as a player all while bringing up countless other players and coaches both famed and forgotten. It shook—however subtly—the core of everyone in that room. With basketball being so global now, Slick brought it all the way back home, back to its roots. And yes, back to Indiana. Tonight, everyone in that room got a glimpse of what we in the Hoosier state likely take for granted: Slick is Indiana. And being from Indiana in that way means you can reach back through time and breathe the air from when peach baskets were used as basketball hoops and games were played in actual cages. Those types of guys are few and far between these days. Slick has endured and was able to tell his story on a national stage in grand fashion, putting an end-cap on a remarkable career. By all rights, Slick is the reigning godfather of the game in Indiana. 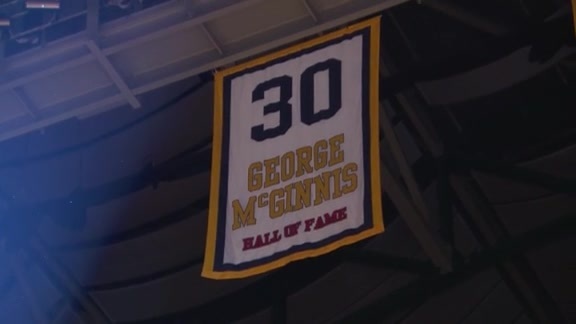 He's a guy who's been around so long, every Pacers fan since the beginning of the franchise knows who he is. He's been around so long, longtime IU fans know who he is. Some people, dare I say, are still alive today that were fans of his in high school in the late 40s. You could even go so far as to make the argument that he's the most important Hoosier ever when it comes to basketball inside the borders of Indiana. Why? He was born here, had success here as a player, then came back and fostered the game at home for the next 50 years. Or, more simply, he stayed when others left. Besides playing pro ball for a year in L.A. after they left Minnesota, he never chased the brass ring or bright lights somewhere else, even though I'm sure he could've had he wished to do so. But, perhaps one of the most remarkable things about Slick is that no one has any bad feelings about him. Talk to 10 fans about anyone else in the basketball universe and you'll get 10 different opinions, some good, some bad. Ask them about Slick and it's all smiles and good cheer. The worst thing anyone could say is some fans felt bad for Slick that his life's work wasn't properly recognized by basketball royalty. Like somehow being from a small town in Indiana and working for an underdog league in the 70s and spending his life in a small market somehow made his accomplishments smaller. We all know that's not true, even if the message we were receiving for years is that it was true. Playing the fool's game, what could've accelerated the timing of his call to the Hall? Maybe doing more of his life's work when the world was paying more attention to basketball would've helped. Maybe if he had a better pro career, it would've helped. Maybe if the ABA wasn't swept under the rug after the merger, that would've helped. Maybe if he would've sought out a national broadcasting announcing gig and made his "Boom Baby!" call an even bigger phenomenon, that would've helped. Maybe. It's impossible to predict because everything he did led to another thing that eventually led to him coming home and never leaving. And here, in Indiana, he created something perfect. And that's the legacy, the personality, the history he takes to the Hall. Not something watered down or something different, something truly Hoosier. Loved and beloved. Exactly how it should be.